AMD was the first out the door with its High-Definition capable 780G chipset 18 months ago, and getting right to the point: we loved it. With GPU offloading of HD media or Blu-ray movies we could use a very inexpensive and low power CPU in combination to make, at the time, a HTPC that was cheaper and lower power than a PS3. The 780G was not complete though, as its Universal Video Decoder (UVD) engine extended from the original R600 (HD2900 series) that lacked high bitrate LPCM 7.1 audio support. This was a limitation only for some though, because many of us don't have expensive AV decks to plug into, so either end up with HD video and 2.0 or 5.1 audio at DVD quality. A little later on in the year, the 790GX chipset also arrived. This was "faster" for (low resolution) gaming with the addition of DDR3 sideport memory, and it allowed the x16 PCI-Express 2.0 lane to be split into two x8s for CrossFire, but still didn't upgrade the video decoding core. In the meantime, the competition also arrived from Nvidia and Intel. Nvidia's GeForce 8200/8300 for AMD CPUs did everything the 780G/790GX did, but also included the LPCM support. In our opinion though, the output quality for features like de-interlacing and noise reduction, especially for HD, were not quite as good. On the Intel front, the G45 had a fantastic quality, but it was generally more expensive and the driver interface was not wonderful and as ever, Intel updates its drivers once in a blue moon. All these chipsets could only muster a single digital video output as well, until the Nvidia GeForce 9300/9400 arrived in September and supported two. So here we are almost a year later and where AMD was once leading, it is now playing catchup - this is where the new 785G chipset comes in. It was once called the 880G, but AMD decided this update wasn't new enough for a whole family upgrade, so it simply tacked on an extra five to make the current model a little better. 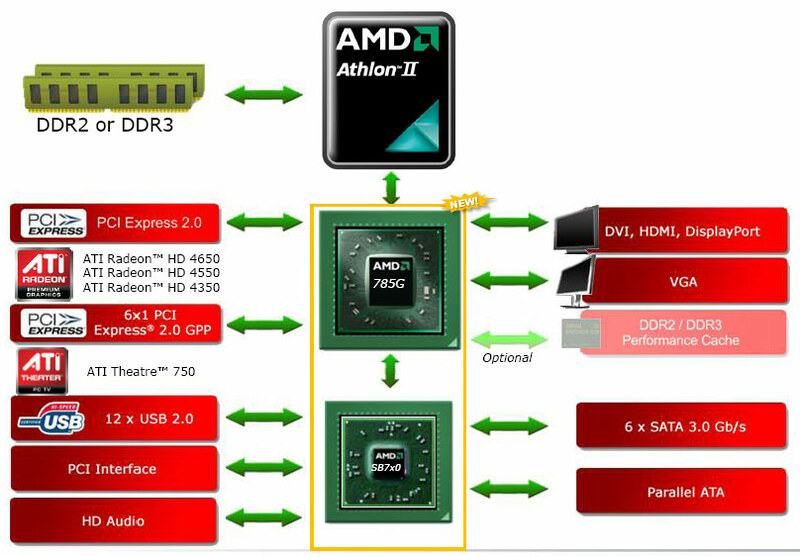 Which is exactly what it is - so well done AMD for resisting the temptation to confuse by claiming the 785G is more than it is: an evolution, rather than revolution. Built using the same 55nm TSMC process the 780G was made on with a very similar thermal output and just a fraction more transistors at a nose over 205 million all packed into a 72mm square die space. It features an updated graphics core from DX10 to DX10.1 with the ever crucial UVD 2.0 engine for Home Theatre buffs. The upgraded UVD engine might say "2.0" on the box but it does not match that of the Radeon HD 4000 series graphics cards because the audio engine still doesn't support full bandwidth LPCM 7.1 audio. HDMI support has been updated 1.3 though and "Video Detail Enhancements" are also a part of the included extras, on top of everything from the 780G. There is also still support for internal and external TMDS chips allowing DVI, HDMI and DisplayPort options. AMD's 785G also officially supports its latest CPUs and the slightly faster HT 3.1 spec at 4GT/s (2,000MHz) that all AM3 CPUs operate at. This in turn obviously extends to DDR3 support, however the 785G can be paired with the older AM2+/DDR2 ecosystem as well. With the AM3 socket there is also AMD's latest PowerNow 3.0 included with C1E support for further clocking down of AM3 CPUs to save more power, and the 785G also clocks itself down to save power and keep cooler when idle. At least, on paper. We test Intel's latest GMA HD graphics in its Clarkdale Core i5-661 CPU to see how it stacks up against AMDs 785G and Nvidia's 9300 IGPs when it comes to gaming and HD video. Long derided as terrible, GMA HD might be about to prove Intel's graphics detractors wrong.